Recently, I was researching almond flour recipes and came across a recipe for Blondies. 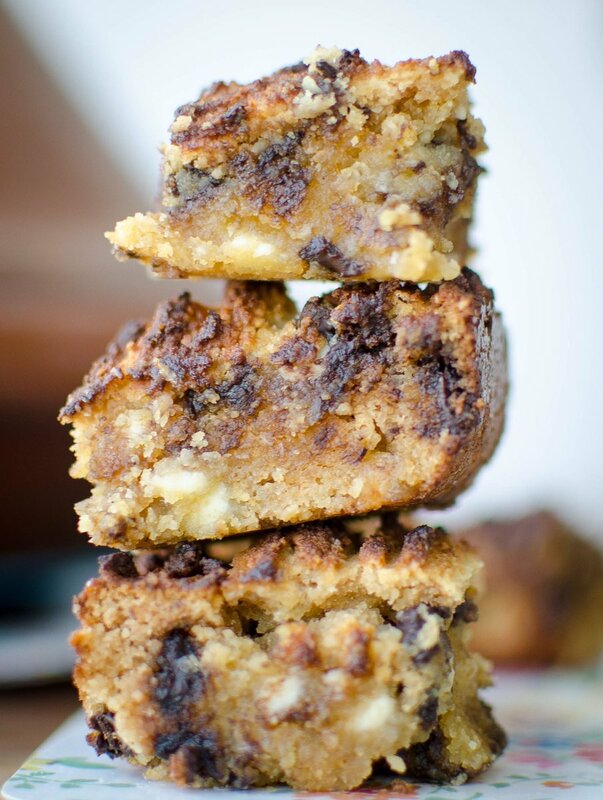 A Blondie is essentially a Blonde Brownie. The recipe I had found online called for ½ cup of coconut oil and 1 cup of sugar. According to myfitnesspal.com a ½ cup coconut = 960 calories and 1 cup of sugar = 720 calories. I challenged myself to re-create the recipe omitting the above and decreasing the overall calorie content whilst keeping the delicious gooey Blondie consistency and texture. Baking with almond flour creates a dense, moreish Blondie, as you can see from the image. Allow them to cool before cutting into bite size pieces, this allows the mixture to set and easier to cut. Preheat the oven 170, fan oven and grease an 8” square baking tray or line with grease proof paper. In a large mixing bowl add almond flour, natvia stevia, baking powder, salt and chocolate chips and mix well. In a separate bowl add eggs and fruit puree, combine well and fold into the dry mixture. Mix until combined well. Pour the blondie mixture into the baking tray and level it off with a wooden spoon or fork. Pop in the oven, bake for 25-30 minutes until golden brown. Allow to cool before cutting or it will crumble. *All ingredients are available in Spinneys or your local supermarket. To read more about Natvia, click here.